Dates are a sweet, meaty fruit, commonly sold as dried. Some grocery stores also sell fresh dates, which generally have fewer calories than their dried counterparts. The calories in fresh dates may contribute to your nutritional goals. 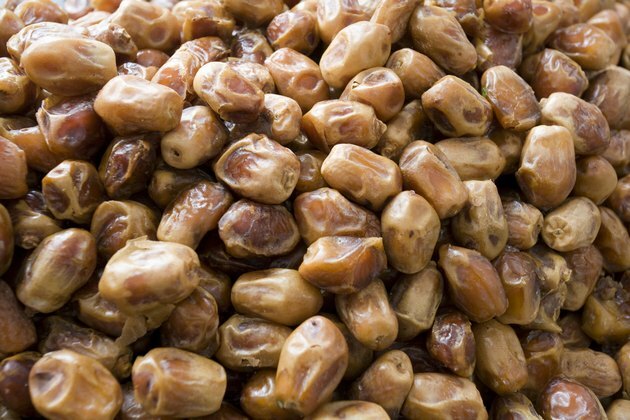 One fresh date, approximately the size of your thumb, contains about 70 calories. Based on a 2,000-calorie diet, this accounts for 3.5 percent of the calories you may consume in a day. The calories in fresh dates come primarily from carbohydrates. One fresh date provides 17 grams of carbohydrates, or 13 percent of the 130 grams recommended for daily consumption by the Institute of Medicine. One date also contains 0.4 grams of protein and trace amounts of vitamin C and fat. Including dates in your diet may have health benefits. Research published in the January 2002 edition of the "Journal of Agricultural and Food Chemistry" indicates that this fruit has antioxidant properties that may prevent damage to your cells from free radicals.